The Amalfi coast town of Positano... beautiful! Here at Walks of Italy we want to help you travel smarter and get the deepest cultural experiences possible in the places you visit. If you enjoy our blogs take a moment to check out the expert-guided tours that we run all over Italy. When it comes to spectacular views and cute seaside towns, both the Amalfi coast and the Cinque Terre of Italy make for excellent destinations. Deciding between them can be difficult, especially if you’ve never been to either! We know it’s hard to choose between the Amalfi coast and the Cinque Terre so we’ve put together this handy little guide to help you decide which one is better for you. We love them both but there are some important differences betwen them. For more on both coasts check out our blog pages dedicated to the Amalfi Coast and the Cinque Terre. Lastly, if you’re short on time and only can choose one, Walks of Italy offers an Amalfi Coast day trip from Rome by high-speed train tour, as well as a Cinque Terre day trip by high-speed train from Rome. Here’s one easy way to decide between the two coastlines: the Cinque Terre is located on the coastline of northern Italy, while the Amalfi coast is in southern Italy. Depending on where you are coming from, one stretch of coastline will usually be far more accessible than the other! From Florence, you can get to the Cinque Terre in about 2 hours, either by car or train. From Milan, you can drive to the Cinque Terre in a little under 3 hours, or get there by train in 3.5 hours. The Amalfi coast, meanwhile, is better accessed from Rome or Naples. From Naples, it’s just an hour on the local Circumvesuviana train to Sorrento. From Rome, you can either take the train first to Naples and then switch to the Circumvesuviana train or to a ferry (the fast train from Rome to Naples takes only 1 hour 10 minutes). Or you can take the train directly from Rome to Salerno, on the other end of the Amalfi coast (the fast train takes just 2 hours). (Check out our blog post on why you might want to consider staying in Salerno as an alternative to Sorrento or other Amalfi coast towns!). If you’re coming in Spring or Fall remember that the weather will be balmier and drier the farther south you go… so the Amalfi coast might be a better bet. That’s also true because when it rains in the Cinque Terre, the famed hiking trails can get washed out. That doesn’t make winter a bad time to come, but it will probably affect what you get up to. For more info check out or blog on traveling the Cinque Terre in the off-season. If you’re coming at the height of summer, on the other hand, the Cinque Terre tends to be slightly cooler. Hiking in the Cinque Terre: sometimes tough, but beautiful! 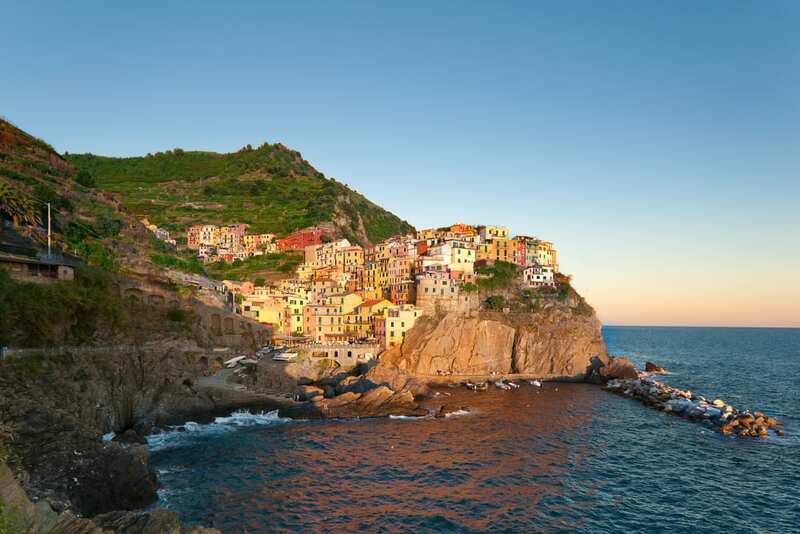 The Cinque Terre is famed for the hiking paths that link the five towns, and with reason. They’re spectacular! With gorgeous views of the sea and the towns (we love the path that comes into Vernazza, giving you a beautiful panorama of the village from above), they’re a must-do for any hiking enthusiast. But there are a couple of caveats. First of all, these paths get very crowded in the high season, roughly from May through September. Secondly, they’re also extremely narrow, with steep, sheer drops to one side—so if anyone in your party is slightly unstable on their feet, or scared of heights, we don’t recommend them! (Instead, stick to the Via dell’Amore, the wide, flat, paved path that links Manarola and Riomaggiore). Read our blog on how to hike in the Cinque Terre. It’s also worth remembering that the Amalfi Coast also has some great hiking. We especially love the Sentiero degli Dei, or “Path of the Gods.” (And check out our blog post on hiking in Italy beyond the Cinque Terre for more ideas of where to hike and trek in Italy!). Yes, both the Cinque Terre and Amalfi coast have spectacular, seaside views. But when it comes to specific cultural or historic sights, the Amalfi coast has the Cinque Terre beat. The list includes the gardens and villas of Ravello, the historic cathedrals of Amalfi Town and Salerno, and a number of (small) museums, including the ceramics museum in Vietri sul Mare, paper museum in Amalfi, and Roman villa museum in Minori. And that’s not to mention all of the attractions in Salerno alone, including its castle. The Amalfi coast is also better-positioned, and better-connected, for day trips to other major sights. Depending on where exactly you’re staying, you can easily day-trip to Capri, Pompeii, Herculaneum, Paestum, and Naples, among other options. So when it comes to sightseeing, the Amalfi coast has our vote. (Don’t miss our post on five must-see sights on the Amalfi coast!). The Amalfi coast’s history as a posh resort area means it’s chock-full of luxury hotels and 5-star restaurants. Of course, you can also find economical B&Bs and a more laid-back atmosphere, especially in more off-the-beaten-path towns like Ravello, Vietri sul Mare, and Salerno. But the main centers definitely have a little bit more of a “resort” feel to them, especially Positano. The Cinque Terre, on the other hand, has developed as a tourist destination in more recent years. So the establishments in the Cinque Terre tend to be cheaper, family-run B&Bs, rather than high-end, luxury resorts. That also means that, while there are just as many crowds in the Cinque Terre as the Amalfi coast, they tend to be of a different variety: There aren’t a ton of backpackers heading to, say, Positano any more, but you will still see them trekking the Cinque Terre. The road that winds along the Amalfi coast is world-famous for its gorgeous views, adrenaline-inducing curves, and sheer drops to the water. If that sounds great to you, head to the Amalfi coast—the Cinque Terre doesn’t have anything equivalent (in fact, it’s usually better to take the fast, cheap local train between the five towns). Just remember that, while renting a car and driving the Amalfi coast road is recommended for confident drivers only, the SITA bus, which follows the same route, gets quite crowded (and hot) in the summer. The Towns of the Amalfi Coast and the Cinque Terre are not the small fishing villages they once were. Instead, they’re resort town and really amazing resort towns at that. But don’t expect to be the only person in them speaking English, especially not in high season. Of course, this isn’t that surprising. The Amalfi coast has been a major tourist destination since the 19th century. As a result, its most famous towns, particularly Positano, Amalfi Town and (even though it’s not technically on the Amalfi coast) Sorrento, are full of people from all over the world seeking out great food, sunshine, and crystal clear waters. Though the towns of the Cinque Terre have been popular travel destinations for a much shorter amount of time, they are currently very, very hip. Yes, these five little towns were once authentic fishing villages. And yes, many of the establishments in them remain small, family-run operations. But the towns themselves are now almost completely reliant on tourism; fishing makes up relatively little of the local economy. If your top priority is getting a feel for authentic, Italian fishing villages, therefore, we recommend a different region altogether, like Puglia (here’s our list of reasons to visit Puglia, in pictures! ), the Tuscan coast along the Maremma, Le Marche, or Sicily. But as long as you know what you’re getting into both the Amalfi Coast and the Cinque Terre feature some of the most beautiful and relaxing coastal towns in the world. Whether high or low season we definitely recommend giving them a visit. Have you visited the Amalfi coast or the Cinque Terre? Which one did you prefer? Let us know in the comments! While I absolutely love both destinations and think this article did an excellent job of listing the many deciding factors, the additional towns along the Ligurian coast outside of the Cinque Terre are certainly worth a mention adding to the lure of this region. My favorite little town up by Santa Margherita is called Comogli – fishing is still the livlihood – but so indeed is fine art of living…. and there are many wonderful trails in this region. Hike to the monestary of San Fruttuoso for an amazing experience. Ahhh, Italy. So much to love!! No doubt that they are both spectacular, but also too ‘touristy’ in the summer. That said, Positano is a favorite hide-away of ours at other times. I shared your link on Amalfi vs. Cinque Terre on my post about 5 Reasons to Visit Amalfi. Please look at my site and feel free to link to me. I am now delightfully following you! Hi, just discovered your blog and love it! My husband and I are planning a trip to Italy next May and were just considering the same question. Amalfi vs Cinque Terre? This is the problem we have: We are visiting our friends in Ferrara for 4 days then planned on taking train to either Cinque Terre or Amalfi. Now I know it would be closer and less travel to do Cinque Terre but I really rather see Salerno, Ravello ect… plus we may bring our 11 and 8 year old so not sure about those narrow hiking trails for them ( only been hiking 3x and not that rugged of terrain) What advice would you give us? Thanks for stopping by, and for your kind words! Be aware that it’s quite a haul from Ferrara to either the Cinque Terre or the Amalfi coast. The fastest train from Ferrara to Salerno takes 5.5 hours (that includes one change), while the train to La Spezia is 4 hours, and then it’s another 45 minutes or so to the Cinque Terre. So either way, you’re in for a little bit of a trip. It’s worth it if you’re planning on spending more than a couple of days in either place, of course, but might be worth reconsidering if you only wanted to go for 2 days or fewer, especially with little ones. Since either one is going to be a bit of a trip, we’d say go with your inclination and head to the Amalfi coast 🙂 The Cinque Terre can definitely be fun for kids, but no, we wouldn’t say that all of the hiking trails are appropriate for children, as they can be quite long and difficult. Hi, sorry it has taken me so long to reply. Plans have changed a little, we will not be taking kids and we will be visiting friends in Ferrara first for five days and then to the Amalfi coast for seven days. We are staying in Praiano so were planning to take the train to Naples but the owner of the B&B said to take train to Salerno then ferry to Positano. We will be there the end of May. What would you suggest? Hi Rebekah, we agree with the B&B owner that the ferry to Positano is the best option, followed by taking the SITA bus, a traditional taxi or water taxi. Another option would be to take the Circumvesuviana to Sorrento, followed by a bus to Praiano. Do let us know if you have any further questions! This article was very informative. We chose the Amalfi coast. Looking for a nice place to stay. Thinking 3 nights in Positano and 3 nights in sorrento. We’re happy the article helped you! We’re sure you’ll enjoy both Positano and Sorrento, wherever you decide to stay! Great comparisons! Looking forward to check it out personally! I think that I’m partisan, maybe 🙂 but I love Cinque Terre! My family and I were planning on going to the Cinque Terre, but found all this info that the trails are closed because of a landslide. I was just wondering if this was true, and should we avoid the area all together because of the crowds. A trail can be closed for a landslide one day and open the next, so don’t let it deter you! This also happens much more in the early spring and late fall than in the summer months, so it depends on when you’re coming. Of course, in the summer, yes, there are tourist crowds. If you’re looking for a seaside area more off the beaten path, which the Cinque Terre no longer is, you might want to look into Puglia, Calabria, or even the area of Maremma in Tuscany. Let us know if we can help with anything else! My decision is very easy since I was born in Salerno therefore the AMALFI is my Paradise. Thanks for your blog. We’re going on our honeymoon in September and trying to decide whether to go to Amalfi Coast or Cinque Terra. Other places we want to visit in Italy is Rome and Venice and then departing to either Barcelona or Seville in Spain. I keep changing my mind from all the info I get haha! We only have 3 weeks so don’t want to spend our whole time travelling. We’re happy to help! It’s all really down to personal preference, which is why we try to outline some of the main differences between the Amalfi coast and Cinque Terre in this post. As a general rule of thumb, though, remember that while 3 weeks is a good amount of time, you probably don’t want to feel rushed or stressed on your honeymoon—so err on the side of packing in less and enjoying more! Let us know if we can help with anything else! Hi, I really want to go to both places. My husband and I will be in San Gimignano for a wedding July 12 and 13. Then we were going to head to Florence for one night, 14th. Then to Cinque Terre for one night, 15th (I would like to get some hiking in) and then go to Positano the 16, 17, and 18. Then go to Milan for the night because we are flying back home early on the 20th. Does this sound like too much? Please let me know as soon as you can. Can you get to Positano from Cinque Terre? We’re happy to help! You’re certainly packing in a lot—keep in mind that Florence alone really takes at least 2 days to see all of the major sights. However, if you just want to get a feel for various parts of the country (and you don’t need a lot of downtime! ), your itinerary could work. Everyone is different! One thing we would recommend, though, is not doing just one night in the Cinque Terre and then heading south to Positano the same day as doing a hike. Positano is definitely not easy to get to from the CT, so that does sound like too much. (You’d have to take the local train from CT to La Spezia, another train La Spezia to Florence, another train Florence to Naples, yet another train from Naples to Sorrento, and a bus from Sorrento to Positano. Yikes!). Because the Amalfi coast and the Cinque Terre each offer many of the same things (hiking, beautiful views, seaside, resort towns), we’d recommend that you pick one or the other for this trip. I love your in detail comment and it really has helped put things in perspective for me. My family and I (3 adults) are going to be driving from Rome to Munich and we have about four days to do it. I want to visit Cinque Terre and am hoping to cross into Germany via the Stelvio Pass (wishful thinking i hope it’s not). My question is, how do we get to Cinque Terre from Rome, which route should I take and should I do it in a day or break it up in Florence or some other recommendable place. 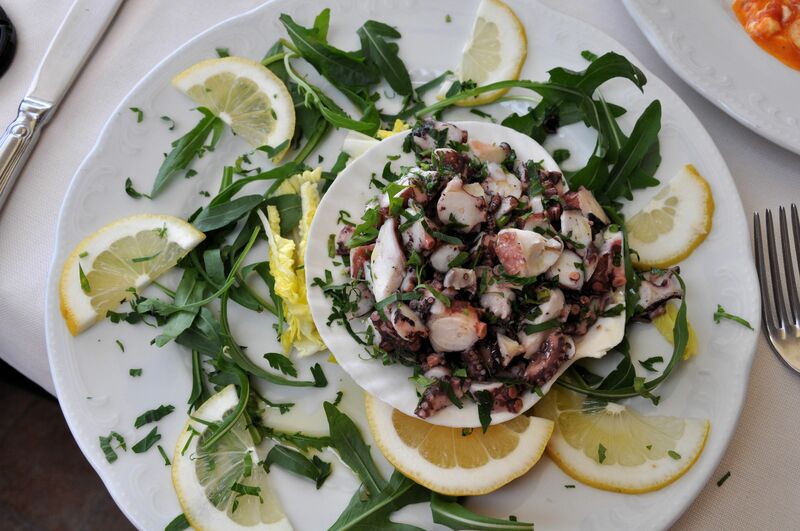 We don’t mind a small Italian town either, just to get a taste for the typical Italian way. I understand you’re no tour guide, but right now, any advise would be great. Of course, we’re happy to help. From the Cinque Terre, you’ll take a train from La Spezia to Rome (you’ll have to switch); just put in La Spezia as your starting point and Roma as your destination on trenitalia.com and it will tell you exactly what to do. It does take several hours, so breaking it up with a night in Florence can be a great option—there’s a lot to do in Florence, so you might even want to spend a whole day there. Other, less touristy cities we like, depending the route you take, include Bologna and Lucca. Let us know if we can help with anything else! We’re happy to help! Rome and Florence will be great for sightseeing, but also for meeting other young travelers. We’d also definitely recommend Puglia, and possibly instead of the Cinque Terre, as in August the Cinque Terre tends to be filled with more American tourists than locals. (The coastal towns in Puglia get their fair share of tourists, too, but mostly Italian). You might also consider Umbria, one of our favorite regions, which is a lot like Tuscany but less touristy. This post should help you get started. Please let us know if we can help with anything else! Hello, my family and I will be fortunate enough to spend 3 weeks Italy and will most likely be able to visit both of these locations!!! !We will be in Florence for about 5 days and 1 of those days we wanted to do the Cinque Terre. I’m sorry to ask but from what I’ve read we can take a train from Florence to La Speiza which takes about 2 hrs? Then connect there to any one of those towns to catch a trail? Can I buy train tickets online or are the transfers and everything readily avaliable to buy at the train station the day of? Any help would be appreciated and thank you! Yes, that’s correct! You can buy train tickets to La Spezia online, but not for between the CT towns; you can do that just before the train departure, at the station itself. Here’s everything you need to know about taking trains between the Cinque Terre towns. Let us know if we can help with anything else! Sounds like a lovely trip, Arun! Do let us know if we can help with anything at all. My husband and I will be heading to the Amalfi coast in July 2014 where we will celebrate our 35th wedding anniversary hiking between towns. How would you compare the trails here with those of the Cinque Terre?? I read your post comparing the two destinations. You talk about the trails in the CT but no details about those on the AC. Any info. would be appreciated, thanks! That sounds lovely! Like the Cinque Terre, the Amalfi coast has a variety of hiking paths, ranging in difficulty, and with spectacular views; they’re just a bit less well-known than those in the CT. 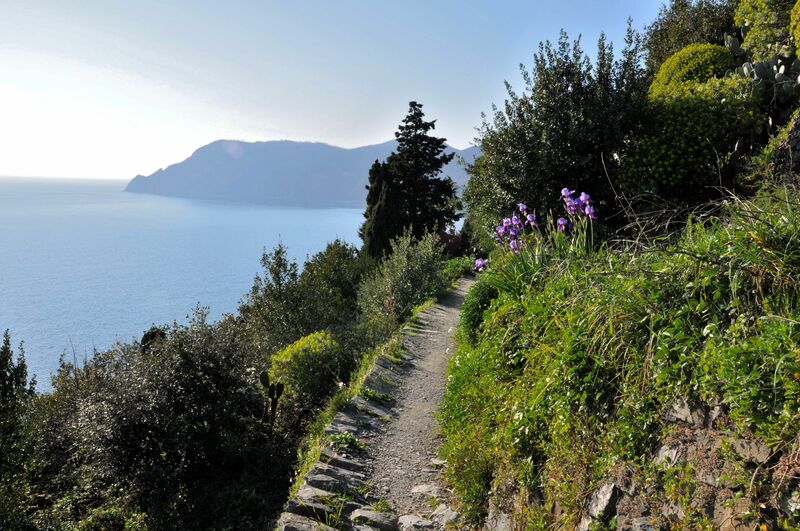 The most popular hikes are Atrani to Amalfi, and the “Path of the Gods” we mention. 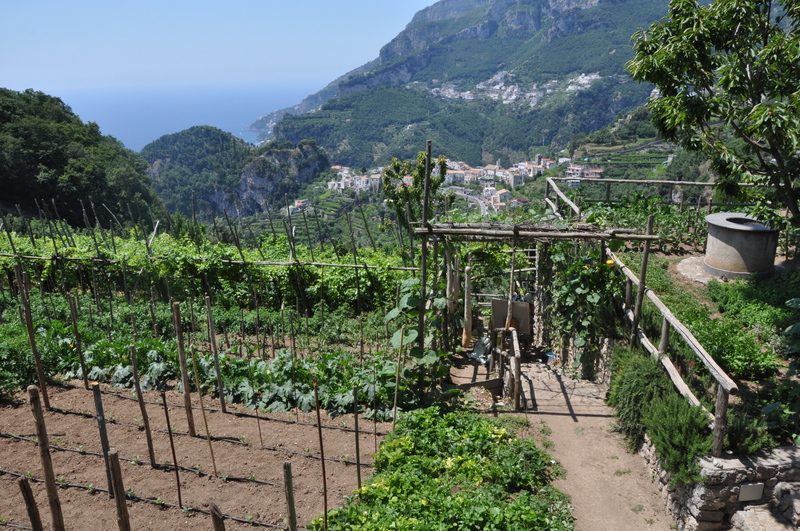 For more complete info about hiking in Amalfi, check out this site. My husband and I are planning a 1 week trip to the Amalfi coast for our 10th anniversary. We will go last week in June 2014. I’m not sure if that is high season or not, but do you have any recommendations on the best places to stay (towns, lodging)? We’re not on a budget, but I’ve heard that Europe in general is very expensive, so we’re looking for something in the middle price-wise. Do you have any recommendations on how we should start our research? Thanks. That sounds like a lovely trip. Yes, you are going to the Amalfi coast in high season (high season there is essentially late April to October), so prices will be higher than in other times of the year, but you can still find deals. We recommend booking a B&B or apartment over a hotel, which tends to give you more “bang for your buck,” and that you also consider staying in one of the more off-the-beaten-path towns, like Ravello or Salerno, opposed to the more touristic (and therefore more expensive) spots like Positano or Amalfi. For where to start your research, why not start with the number of posts we’ve written on the Amalfi coast and what to do and see there, here. My husband and I are planning a family vacation with our adult children for 2 weeks the end of Sept. 2014. We were thinking of flying to Pisa and spending a week along the CT and Almalfi Coast then a week in Siena doing day trips. I am really concerned about the crowds while in CT and Almalfi Coast. If we went north or south of CT do you have any suggestions? I was looking for less touristy but still enjoying the coast and some hiking. Hello, Barb! We think the end of September is a great time to visit the Amalfi Coast and Cinque Terre as the crowds generally decrease compared to the prior summer months. We love the Golfo Paradiso area west of Cinque Terre and very close to the large city Genova. Salerno is also a good alternative to the Amalfi Coast with stunning panoramas and less tourists. Let us know if we can help with anything else! My husband and I will be travelling to Italy for 8 nights in April/May 2014 with our 7 month old daughter. We are thinking of the Amalfi Coast (maybe staying in Sorrento) so we can do day trips to Amalfi, Pompeii, Capri etc. Any advice you could give regarding this with a 7 month old would be great. That sounds like a lovely trip. However, we’d suggest an alternative to Sorrento; Sorrento is lovely, but quite touristic and can be expensive. We like Ravello and Salerno as alternatives. With a baby, just make sure to pace yourself, but the Amalfi coast is quite relaxing, so you shouldn’t have any trouble! Let us know if we can help with anything else! Hi we really are stuck on Italy. We are 24 year old females and we want to experience as much of Italy as possible. We have 14 days in Italy and start in Milan. The places we would love to cover are venice, florence, Rome, Naples and try fit in Tuscany if possible. We can’t decide on Cinque Terre or Amalfi coast. We are pack backing and want beautiful scenery, beaches and nightlife/history culture. You’ll find more nightlife in the Amalfi coast than the Cinque Terre, but be aware that neither area is particularly well-known for its nightlife! Neither coastline also boast great beaches; they’re more about the scenery. fly into Milan — CT — Florence (or should we do Venice?) — Rome, where we leave to head home. We land on March 31st, and leave on April 7! Hi, really liked the article, very informative. We were planning a trip to Italy in sep-oct this year and have bought our tickets, flying into milan and then flying out from rome. Itinerary we had planned was milan, lake como, venice, florence, tuscany region, rome. Was also wanting to squeeze in either cinque terre or amalfi coast. We have a total of about 18 days. Can cinque terre be fit into this route, given we are landing in milan and flying out from rome? or will we be backtracking a lot if we go from either venice or florence to cinque terre and then to the other? Thanks for your suggestions ! Hi Ira, thank you very much! Either of the two destinations can fit into your itinerary as Cinque Terre is a 2.5 hour drive from Milan and the Amalfi coast is around 3 hours from Rome. You may want to arrange your trip to visit Milan, followed by Cinque Terre and then head down to Tuscany, or do a weekend trip to the Amalfi Coast before departing from Rome. Buon viaggio and do let us know if you have any other questions! Thanks so much for your amazing article – so informative! My friend and I are going to Cinque Terre in May for one week and I was wondering where else we should go in that week besides Cinque Terre? We are interested in beautiful beaches, scenery, good food and wine, and going to bars at night? So what would the closest and best option be to visit for a couple of days? Also, in Cinque Terre where do you reccommend we stay? I noticed you advised someone visiting the Amalfi Coast to stay in B&B or apartments but is that the same in Cinque Terre or do you reccommend a hotel? Hi Melissa, thanks so much! If you’re interested in exploring nearby cities, we’d suggest a short train ride to Pisa, Lucca, Genova or Milan for a day trip or overnight stay. We also recommend staying in a B&B or apartment in the the Cinque Terre to save money and enjoy an authentic stay. Buon viaggio! 1) If flying in from England, where would we fly into if we’re staying at Cinque Terre? 2) Would we need to catch any trains to get to CT? 3) We have 7 days in Italy, would you reccommend spending all 7 days in CT or visiting another city? If so, which city? Hi Melissa, Genoa is the closest airport, but is pretty small. If you can’t find a flight into Genoa, Milan or Florence would be your best bet. We would recommend spending half your time in CT (especially in the summer so you have time to enjoy the great beaches) and visiting other nearby cities like Genoa, Florence, Milan and Pisa. Do let us know if we can help you with anything else! Thinking of a November ’14 trip. Which place would you recommend this time of year? We are considering 10 days – Rome and Amalfi Coast or Florence and Cinque Terre. I understand that this is the offseason but will most of the shops and restaurants be open this time of year? I assume the weather is far better in Amalfi Coast than Cinque Terre? Thanks for your help. Hi Matt, if you’re looking for warmer weather we would suggest Rome and the Amalfi Coast as temperatures are usually higher in Southern Italy. Restaurants and shops are usually open along the Amalfi Coast in November with a much lower number of tourists. Buon viaggio and let us know if you have any further questions! What an informative article! My fiance and I are planning our honeymoon in Italy for spring/early summer 2015…our dates are flexible but we really want good weather, when would you reccomend? I have fallen in love with Positano based on my research, mainly the photographs. Is it so much of a tourist trap? I really want to get a feel of an ‘old world’ lifestyle. Does Selerno give you more of this feeling? I would really like to hear more Italian than English, with farmers markets instead of gift shops. We were planning to fly into Naples. Hi, love your blog, appreciate all the information! I’m planning my first trip to Italy in September, I’m a little unsure of where to go and now a little overwhelmed with all the options. I’d of course love to see everything but I don’t want a hectic trip, so I think I’d love to stay in only one or two places and just be able to relax. I’d like to avoid any overly crowded touristy spots, but I also would love to be close to great restaurants and beaches..if that’s even possible? Almafi and Positano were on the top of my list, along with the CT. but it sounds like they are all pretty crowded? I’m in my 20’s and I’ll be going solo so I don’t want to be somewhere completely remote, I’d just like somewhere with a slower pace, great restaurants, beaches, etc. I think I’ll be flying into Rome and thought maybe I’d stay just a day there..and from there I can’t seem to decide. Venice also seemed like a great option. What would you suggest? Thanks! Hi, This article is so helpful. I’m a landscape photographer and I will visit Italy for two weeks in May. I’m going to stay Tuscany and Rome for 5 days each.I want to go both Cinque Terre and Positano to taking photograph. What if I have to choose only one, which town will be better to taking photograph? Thank you. Ciao Freddie! Both are equally beautiful, it just depends on what you’re looking for. If you’re searching more luxury you should try Positano and the Amalfi Coast. If you prefer a more rustic and backpacker-ish feeling, head to Cinque Terre. Be sure to let us know which one you pick! Ah ha, I still want to go both but after I read your comment, my balance is a little more Positano side. Thank you again. P.S I am also a backpacker 🙂 so maybe I will try both. Hello, what a wonderful, informative guide. Thank you for such insightful recommendations. I would love to hear your opinion regarding a plan my husband and I have for travelling to Italy. Ciao Jane! We’d suggest an evening or two in the Golfo Paradiso for an authentic feel of the Italian Riviera. From there, we think you’d enjoy spending an evening in Lucca before heading to Rome. Let us know if you have any questions! I love your blog! It is so informative. My husband and I are going to be in Italy for about a week. We have decided to take the train from Rome to Florence where we will spend just one short day, We will then drive to the Cinque Terre area to sprend two nights in Manarola with friends. What in your opinion is the best way to go and where is best to leave the car and find our way to the place we will be staying? When we leave CT we are heading to Venice for two days and then back to Florence to take the train back to Rome. any advice’s here are welcome too. Ciao Linda! Since the towns of Cinque Terre are not very cae friendly, we would suggest taking the train from Florence to the Cinque Terre. If you do decide to take a car, you can park in La Spezia and take the train to Manarola. Let us know if you have any questions! We’ve always wanted to visit the Positano on the Amalfi Coast. Our first trip to Italy finds us in at the end of Tuscany tour ending in Florence on a Friday afternoon in late September needing to return to the US the following Monday morning. Would you make the trek to the Amalfi Coast to avoid a missed opportunity and fly back from NAP or FCO -OR- opt for the Cinque Terre instead due to proximity to FLR? The mult-step process to get in/out of Positano has me concerned that it may not be enough time. Ciao Patrick, a trip to the Amalfi Coast may be a bit rushed, but doable. You could spend Friday and Saturday night there, then head to Florence Sunday evening before your flight. Flying is faster than taking the train, but tends to be more expensive. Let us know if you have any questions! We are planning a trip to Northern Italy next July. The trip starts is Milan and ends in Milan. It includes Parma, Genoa, Santa Margherita, Lake Maggiore and Cinque Terra. This a tour of 8 days. We have never been to Italy and would like to see more. Maybe Venice and then to the Amalfi Coast. I reailze we are all over the place. What is the best way to include these places. We can go a few days earlier before meeting the tour and stay about a week longer. Is it feasible to go to Venice first and Amalfi after the tour. Please advise. Thanks for any help you can give. Hi Mary, Venice is doable, but you should give yourself a few extra days to see the city after your tour. We would suggest taking a train from Milan rather than renting a car. The Amalfi Coast is in Southern Italy and takes around 6 hours by train, so we would suggest spending an extra few days to explore the towns. Let us know if you have any questions! I love your blog! My fiancé and I are planning a honeymoon trip to Venice, Rome, Florence and possibly Cinque Terre or Sorrento. It will be 11 days. If I decide on Sorrento we will fly into Naples, if not, then will fly to Rome. I am looking for something romantic, and a getaway from the hustle and bustle, but also a place with a little nightlife (bars not clubs), as we like to go out for drinks later in the night to relax. I have read your honeymoon blog and think it’s great too, but the cities seem too far from the area I will be (Florence, Rome, Venice). What would you recommend? A friend and I are flying into Milan early morning on 7/27 & depart early morning on 8/2. We plan on spending the first night in Milan and also going to Venice, Rome, and possibly Florence. We would also like to spend 1 day at the beach. Which beach would you recommend? Is this too much for 1 week? Which city would you say we should cut out, if any? After reading all of the above comments, both locations sound so amazing and I don’t know how to choose! How feasible is it to try to do both in one (approx 10 day long) trip? Perhaps flying in near one and then taking the train to the other and flying home from there? What a great article! My daughter will be studying abroad in Florence and my husband and I, along with my kids, 11,13, will be visiting her for 10 days on our Easter break 2015. We want to either do CT or Amalfi Coast. I feel the time of year dictates we go to Amalfi Coast. We plan on taking our college student as well. Does it make more sense to just go to CT? We also plan on spending a few nights in florence and possibly do pisa and/or venice. Any recommendations would be very much appreciated! My wife and I are traveling to Italy with our 2 adult sons. We are flying into Rome and driving directly to Positano. My questions are- which is the best route and will I have an issue parking in Positano? We are there for 4 days- is that long enough to see the local towns and Capri? This article is great! Thankyou so much. My husband and I are heading to both cinque terre & amalfi coast in September 2015. Your article helped me work out how to get there and where from. Since we are doing both areas would you suggest flying into Milan then heading to cinque terre, back to milan then flying to Naples and head to Positano (our base for exploring the amalfi coast)? My fiancee and I are planning our honeymoon to Italy! We can’t decide between Cinque Terre and Amalfi Coast. Could you help me? We will be there around May 11th. Would Amalfi Coast be significantly warmer in May than Cinque Terre? We only have about 6 days. I thought if we decide to go to Cinque Terre, we can do couple of days in Florence and then head to Cinque Terre. If we decide to go to Amalfi Coast, we can do couple of days in Naples and then head to the Amalfi Coast. Do you think this is a good idea? Also, which town in the Cinque Terre region do you recommend for a young couple? What about the Amalfi Coast? Italy is a great place for a honeymoon and both locations are beautiful – you’ll have to make the ultimate decision based on the reasons the article states and what you’re both looking for. It’s true that the Amalfi Coast will be much warmer than Cinque Terre, but CT should still have a nice spring weather by May. The trip to Naples from Amalfi or Florence from Cinque Terre are both possible options as well. Have a great honeymoon! In the last week of September and first week of October 2013, we were able to enjoy a wonderful visit to Italy for the first time. We spent 5 days on the Amalfi Coast, and found a lovely, old world, apartment to rent facing the sea in Minori. Minori does not have the tourist feel of Positano, or Capri, or any of the other towns surrounding the Amalfi Coast,so we experienced a more honest and natural visit, at a much more reasonable price. The people, the restaurant’s, the cafe’s, everything made our time there the most relaxing and memorable of our trip and we would most definitely return. Using Minori as our base, we visited surrounding towns, and Naples and Pompei, then traveled by train to Venice for 3 days, which was lovely and memorable for it’s rich history, but cold and rainy, still we enjoyed every moment, then onto Rome and our apartment in Trastavere for the end of our visit, where we visited all that Rome and the surrounding area has that we could fit into our stay. Trastavere, would be second on our list of most enjoyable places visited, but Minori, was the most relaxing and symbolic of true small town living. This is so helpful! I am planning a trip with my husband in late September/early October. We wanted to do 2-3 nights in Florence, 1 night in Tuscany (thinking Montepulciano ), and then 3-4 nights in almalfi. Is this too much? Almalfi seems more desirable to me than Cinque Terre, but it seems like we would be spending a long time traveling from the north to almalfi. Thoughts? Thank you! You can travel from Florence to Naples by train in 3 hours, so it’s probably worth the journey. If you’re driving it will take around 4.5 hours – but probably still worth it. It will be warmer in the south that time of year and there are a lot of towns to explore on the Amalfi Coast. It really depends on what you’re interested in though. If you like walking then Cinque Terre has beautiful tracks between the towns that you can walk, and some vineyards on the upper terraces. 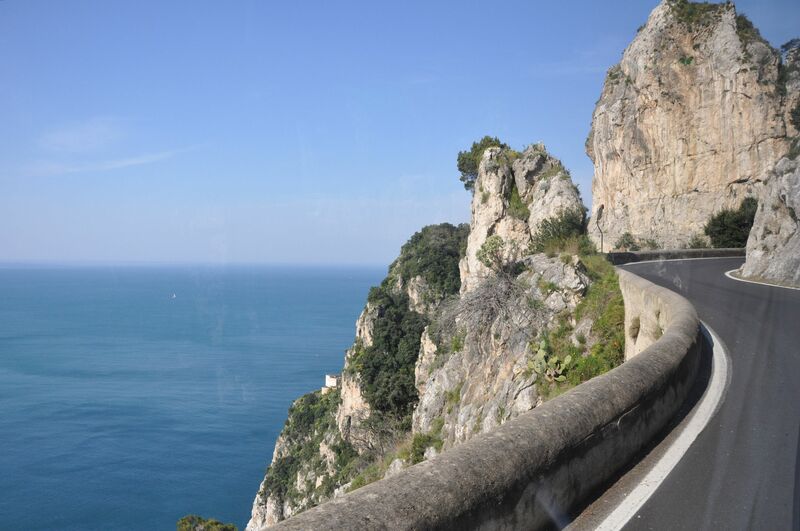 If you have a car to drive around, you can’t beat the Amalfi Coast. It’s a difficult decision but there are no wrong answers, you’ll love it whatever you do. Based solely on the weather, we’d probably recommend making the journey to Amalfi. My husband and I will be flying in to Rome, will be staying in Rome a couple of days, then we will take the train from Rome to Naples, for a day visit. Cant decide if we want to travel to Amalfi or Cinque Terre, but the plan is to travel by train to Pisa, Milan and Venice, where we will be flying out from back to Denmark. We will have 15 days of traveling. Would you suggest some other small towns to visit with beautiful scenic view? If you only have one day in Naples and are otherwise headed north, we suggest Cinque Terre instead of the Amalfi Coast based on time and travel constraints. Italy is filled with wonderful small towns. In Tuscany you can check out some of our favorite day trips here and some of our favorite small Tuscan towns here. That said, we always recommend to spend a bit more time in the places you have planned, rather than trying to visit a new city every day, as it can often be a bit rushed and stressful. Let us know if you have any more questions! Love your article!!! Thank you very much for all the useful info. My boyfriend and I are plannig a trip to Italy mid October this year. We have only 10 days. After reading your article, I would definitely like to stay aprox. 4 nights in Amalfi. On a previous trips to Italy, we visited Rome and Venice. What other romantic, breathtaking, magical places would you recomend? the leght of stay you suggest at each place? This might be “The proposal trip” so I want it to be extremely special and magical! Where would you suggest we land / Deppart ? We want to make the most out of our 10 days! That’s great news Alejandra! You might find this article useful: http://www.walksofitaly.com/blog/romance/most-romantic-hotels-and-places-in-italy-winter Have fun! I am flying in with my wife on June 18th into rome and we fly back from Rome on the 27th. Have been contemplating renting a car and going to one of the two places. What would be your recommendation. We have been to Rome, Florence, Venice before and loved Florence and Venice. My soon to be wife and I will be honeymooning in Italy in June. Our plan is to fly into Venice, rent a car, drive to Slovenia, back to Venice and onto Florence. Since we’re most likely going to be flying out of Rome, thoughts on the easiest option between Cinque Terre and Amalfi. Other than good hiking and nice views, are there good beaches in Cinque Terre? How is driving in Italy? We are thinking of travelling to the Amalfi Coast for a week with kids (aged 8, 4 and 2) and grandparents (relatively fit). Is it doable? Where would you recommend us staying? Thanks. It is absolutely doable! Though we can’t decide your stay for you, we often suggest Salerno over the more-popular Sorrento. Read here for more information. Have a great trip! Hi, I’m planning a trip to Italy this June and would love your advice! I’ll most likely be flying into Rome and spending 2/3 days there, and then either going to the Amalfi Coast or CT. I’m 21 and travelling with a friend- and I know that CT is more backpacker-friendly and affordable, but does that mean Amalfi isn’t a viable option for us? I’m not averse towards hiking but I don’t know if hiking every day really is my sort of thing! Do you think someone of moderate fitness would find it ok? Also, how many days would you recommend in each place? We’re kind of looking for a shorter stay than something like 8-10 days. Thanks so much in advance! If you have 8-10 days in Italy, we suggest you spend at least three days in Rome, and the rest of the time in either Amalfi or CT, whichever you prefer. Both locations are completely doable for hikers and non-hikers alike! The Amalfi Coast can often be a bit more expensive, though the two are rather similar in price and should be budgeted accordingly. If you’re worried about time, you can try a day trip, like our Amalfi Coast day trip from Rome or another one of our planned tours to keep you on track! Hello! How far is Puglia from Cinque Terre & is it possible to do both in just 10 days? Puglia has me very interested!! It’s approximately an 8.5 hour train ride from La Spezia (the train station just outside of Cinque Terre) to Bari, Puglia, with a connection at Rome. (see here: https://www.rome2rio.com/s/La-Spezia/Bari) You can definitely split your time between Cinque Terre and Puglia, but keep in mind that you’ll lose almost a day with traveling, or two if you need to return to CT for a flight connection. Both areas are beautiful and with a bit of planning we’re sure you’ll be able to have a wonderful travel! Just found this site on a search and wow it’s so informative. I’m coming to Italy in September and have booked 5 nights in positano. My problem is that I’m anxious to go in that coastal road and having trouble confirming if ferries run at this time. Sept 24 to 29. I’m thinking to train from Rome to Salerno and then ferry to positano. Is this possible at this time of year? Can I prebook the ferry if it is! Which ferry company? The sites I have found at ever confusing. Thank u and look forward to your response. Thank you, we’re glad we could help! Ferries absolutely run that time of year. Though we don’t know for sure based on the website, it’s likely that they don’t have that information so far in advance, a common theme on Italian transportation websites. While you can book in advance, you certainly don’t have to, especially for end of September when there are fewer visitors. Here we’ve found that the Salerno to Positano should take about 70 minutes and cost 10 euro. Or, if you prefer to follow the road, you can take one of the many SITA busses that follow along the entire coast, stopping at any city you wish along the way! If in doubt, go both! I will travel from Milan-Florence-Naples-Rome. Really cannot wait! My husband and I are heading to Europe in October. We are doing two nights in Dublin and two nights in Paris before landing in Venice. We will be in Italy for 9 days. Of course, I want to see everything but I know that is not possible. Is it insane to try to fit in Venice, Rome, Sorrento, Florence, Pisa and Pompeii? How would you recommend the itinerary go? Any guidance here is appreciated as I am getting so confused. Amazing ! This is just gorgeous ! *love* it all as the messages, the pictures and the quality of the writing. Thanks ! Great article and very informative blog. We are a bit like Heidi above – so much we want to see and what’s the best way to do it. Arriving in Italy early October, we are thinking either fly in to Milan or Rome from Paris and hire a car to do our travel. We’d like to see Milan, Lake Como region, Venice, Rome, maybe Florence / Pisa and had been tossing up between Amalfi coast or CT. From what I’ve read above it sounds like the Amalfi Coast would suit us better to unwind at the end of the trip before we fly back to Australia. The dilemma is that if we pick up a car in Milan, we have to work out which is the best way to do the rip and arrive back in Milan to avoid excessive remote drop off fees. Any thoughts? Hello and thank you for your blog – it is so informative! I am travelling with my son for only 5 1/2 days. We are planning to spend 1.5 days in Rome then move on (before heading quickly back to Rome for our flight home). I had read your blog – and was really interested in Cinque as it looks just beautiful however I am thinking the Amalfi Coast may be easier to get to – is that true? I am really interested however in the pictures of Puglia, and salerno, and the coast. Any thoughts for a quick 3 day trip (out of Rome) would be really helpful – am a bit stuck! Seeing as how you only have a short time, we definitely suggest you head to the Amalfi Coast rather than Cinque Terre – You’ll waste less time on public transport! You can spend a few days in Rome, one in Naples and one along the coast as it’s all rather connected. We have many short day trips throughout the Amalfi Coast that can help you and your son get the most out of your time, such as our Pompeii tour from Rome with a private Amalfi Coast Drive. Or, if you’re looking for a shorter tour, you can try our Pompeii and Vesuvius tour with a jeep ride up to the crater of the volcano! Thank you so much!! This is really helpful. Will also look at the walking trips, may save us time and be a little more adventurous! Hi! Loved the article and info. Decided on CT this time round. What is the easiest way to get there? Flying to Italy from NYC/JFK and would like to take a direct/non-stop flight- followed by the quickest/direct train route to CT. It seems Florence and Milan are the best bets for airports? But what do you suggest? Thanks in advance! Great decision! You will most likely fly into the Pisa International Airport. From there, you can take a direct train into La Spezia, the final station before entering Cinque Terre, in under an hour. (If you do somehow fly directly into Florence, it’s a very quick and inexpensive train ride from there to Pisa). Milano Malpensa is a large and efficient airport, but the train into Cinque Terre makes many stops and you might even have to change lines. Let us know if you have other questions! Hello! Thanks for taking the time to make all of this wonderful information available! I am planning on visiting Italy next summer in early June for two weeks. I was hoping to start in Venice (three nights) and end in Rome (three nights). Other than that I have been trying to figure out if Cinque Terre or the Amalfi coast would fit my itinerary better. I really want to see Pisa and Florence, and am open to seeing just about any other city but I don’t want to over pack my schedule and spend most of my vacation in transit. I am a first time solo female traveler (yay!) and while I plan on learning a bit of Italian I will not be anywhere near fluent. So I’m looking for a good time without too much fast paced traveling so that I can limit issues and really enjoy myself. I am looking for beautiful views and hoping to have the chance to be in a slightly slower paced Italian town to try to have more unique and memorable experiences. Hopefully you can give me some advice. Thanks so much! You’re right, there are a ton of amazing towns in Italy that it can be easy to over-schedule on a trip to the country. In your itinerary, Cinque Terre is definitely more “along the way” than the Amalfi Coast, and you’d even pass through Pisa and near Florence on your way from CT to Rome! That said, adding all those stops is certainly going to make your trip more go-go-go and less relax. We suggest choosing on of the two (CT or Pisa/Florence). If you just can’t decide, you could spend a couple days in Cinque Terre and make a half-day stop in Pisa on your way to Rome, but we suggest giving Florence the time it deserves – at least 3 days! Let us know what you decide. No matter what, we’re sure you’ll have a great trip! I love this site and am so happy to have found it! I tried to read through as many of the former posts as possible to make sure my question is not a duplicate, but there are many posts! My husband and I are planning a trip to Italy for the first two weeks of May. We are staying in the country about 20 minutes east of Florence for the first week and then in a Positano villa for the second week. While in Tuscany, we definitely plan to visit Lucca, Pisa, Siena, etc. Beyond that, we are thinking about taking a couple of day trips to more distant locations to have different experiences. Options we are considering are Cinque Terre, Venice, Milan, Rome. It sounds like there are some important differences between the Amalfi Coast and Cinque Terre, but are they different enough to warrant taking a day of our Tuscany travel to visit Cinque Terre, since we will be in the Amalfi Coast for a week?? Or are they similar enough that the other options might be better? And if using high speed rail, are day trips to Venice or Rome doable? Thanks for any advice you can provide! Hello! My husband and I and our 3 teen/young adult children will be traveling to Italy Dec. 20th through January 1st. I know that this is not the ideal time of the year to visit your beautiful country, but it is the time we have available with our varying schedules. We plan to fly into Venice spending two nights there. We will then travel to Florence for 3 nights, then to the Amalfi coast area for 4 nights, and then onwards to Rome for December 30th and 31st. We are trying to decide if we should rent a car in Venice and return it in Rome or use the high speed trains to travel from city to city, or a combination of the two. Any advice you could offer would be great. Also, I’m a little concerned about restaurants being closed in the Amalfi coast region. I know that the boats/ferries will not be running. Is this area worth the 4 night visit during the winter months? Thank you! It sounds like a great itinerary! During that time you’ll find some restaurant closures wherever you go, so we’re sure you’ll be ok in the Amalfi Coast. Plus, it will be warmer than the north of Italy! Though you can drive, all of the cities on your itinerary are easily accessible by high speed trains and that might be the easiest option for you. Our article on how to travel Italy by train might help you decide. Does this sound like a good itinerary? We would like to spend more time at the CT, but can’t squeeze it in. I’m also concerned about how hard it is to get to Amalfi from Rome, then back up to Florence from Amalfi. Could you provide advice. We were thinking of flying into Rome and hitting Pompeii + Herculeneum, Sorrento, The Amalfi Coast, then heading down to Calabria and then flying out of Sicily. Is the weather just too dreadful for any of this? Do you think it’s realistic to be able to cover all that ground in 10-14 days? Anything you’d recommend avoiding or seeing? Any advice would be greatly appreciated! Happy early birthday! If you’re coming to Italy in January, you’ve chosen the right regions to visit. The south of Italy is warmer and has decent winter temperatures as well. It might be difficult to do both Calabria and Sicily at the end of your trip, but it all depends on how much time you spend in each place. In Sicily, you might even be able to take a dip in the sea! Hi! We are researching our trip to Italy for next March/April and love all of your posts. Our plan is about 16 nights, and we always try to avoid the rushed vacation, preferring to minimize time checking in/out of hotels and spent in transit. However, this will be my first time to Italy and there is now way around some of that! Our thoughts now are into Venice 2 nights, down to Florence for 3 nights (with a day trip to CT), Sienna for 5 nights as we plan to do some extensive exploring of Tuscany (we love the wine/food culture of Italy), and then 6 nights in Rome (or combined with Southern Italy). My main question is should we even try CT if only for a day trip? Or would it be better to possibly stay in Sorrento for 2 nights and see Capri, the Coast, and Pompeii? I know we will love it all and whatever decision we make will be good, but I am concerned about not giving CT enough time. Thoughts? Hi, this is great! My husband and I are going to Italy for our honeymoon in April. A friend of mine owns a flat in Manarola and is giving it to us for four nights. We have a jam packed Italian honeymoon planned and only two actually weeks in Italy. We are doing this: We are flying into Rome because it is SO much cheaper than Florence. We are going to spend the night there and explore it a bit the next day before we take the train to Florence. We stay in Florence for three nights and then we are headed to Manarola for four nights. After that we plan to go to Naples for two nights, Capri for three and then head back to Rome to fly home :(. I know its a lot but we rarely get to travel internationally and there is just way too much to see in Italy. Here is my question: given that one day will be getting from Manarola to Naples, should we rent a car from Florence to drive to CT, or should we just rely on the slow train? I’m imagining that our trip from CT to Florence and then Naples will be a long day of traveling regardless of how we get there. Most folks seem to say train and Im wondering if there is any “good” time to take the train, like morning vs afternoon, etc. Wow, what a honeymoon! Train is probably your best bet to get from Florence to Cinque Terre, as there are no cars allowed into any of the towns of CT. There are direct trains from Florence to La Spezia that take 2.5 hours or trains with a change at Pisa that take 2 hours. As for your options from Manarola to Naples, maybe this site can help you. Have a great honeymoon! We are wondering if we should increase our time in Florence by another 2 nights and cut out nights from cinque Terre and Venice? Is there any other areas that you would recommend? We don’t want to be travelling very often.the reason we are breaking up Rome into two parts is so we don’t have a long journey from Sorrento/Salerno to Florence. Wow! What a trip! Perhaps some of our other articles might help you make your decisions. Like this one about the merits between Salerno and Sorrento. We think the 7 nights in Florence are fine, but we’d suggest visiting some of the surrounding towns in Tuscany. You can see Chianti, San Gimignano and Siena on our Tuscan Day Trip from Florence Tour! Let us know what you decide and have a great trip! 2. We would prefer to save time traveling, so thinking of staying overnight in Pisa when we do the Tuscany tour and do Cinque Terre from Pisa and return to Florence. 3. Do you organize tours from Florence to Tuscany and Cinque Terre. 1) We think that Cinque Terre is always beautiful, but if you’re short on time and would like to save time traveling, perhaps December isn’t the best time to visit it. In December the best activity in CT is hiking, though weather and the energy of the children might inhibit that. 2) If you do decide to go to Cinque Terre, there is a direct train from Pisa to La Spezia that takes just 50 minutes. You could easily go and return in a day. 3) We don’t have any tours in Cinque Terre, but we have many tours in Florence that we think you’d like. We also have day trips in Tuscany such as a Tuscan Day Trip to Siena, Chianti and beautiful San Gimignano. We are planning 5 days in Tuscany in June 2016, we would like to do a day trip to cinque de Terre. I realise it would be a long day , but where would you recommend to base ourselves in Tuscany to achieve this. Also we will have a car – so is train or car best to get to CT.
You can absolutely take a day trip from Tuscany to Cinque Terre, though as you said, it will be a long day! There are many trains directly to La Spezia, just outside of Cinque Terre. It takes 50 minutes by train from Pisa to La Spezia. From there you’ll take a train or bus into the Cinque Terre. If you decide to drive, remember that CT is a car-free area so you’ll have to leave the car outside at La Spezia or another nearby city. It all depends on what you want from your trip. Spending just 1 to 2 days in each location is a lot of traveling with not a lot of time to explore. You definitely won’t be able to see everything in Rome in just 2 days, but if you have one specific goal (like seeing the Colosseum or the Trevi Fountain lit up at night) then go for it! The differences between a hotel or B&B is usually just in price, though boutique hotels and B&Bs have changed that a bit. Shop around and find what works best for you. Have a great travel and a great yoga retreat – and let us know if you’re interested in any of our guided tours to make the most out of the short time you have! We will be traveling to CT, 3 people, and plan on staying in early April for 10 days. We intend to use Milan as our in and out bound flights so we can visit the Last Supper and see some of the sights. What are the weather conditions in April in CT? Will we be able to use the walking trails and will they be open? Lastly, is there any night life in the CT region and what village is best to stay in? The weather will likely be pleasantly warm but, like any spring, there’s always a slight risk of rain! You won’t find much nightlife in the way of discotecas in CT, but there are plenty of restaurants to linger of dinner until the late hours as well as pubs and bars. You can check out this website to see if the walking trails will be open. We definitely recommend touring the length of the Amalfi Coast, maybe even taking a bus ride up the coast simply to see the view. That way, you can hop off at different towns along the way that catch your eye. (Here’s an article on our 5 Must-See Sights on the Amalfi Coast) Then, because Positano isn’t all that close to Fiumicino in Rome, we’d suggest heading north to spend a couple days touring Naples. That way, you’re just one high-speed train ride away from the airport. Let us know if you have any other questions! Does this sound like a good and varied itinerary without being too rushed? I have a habit of cramming too much in on holidays and am trying to quit that! I’m also wondering what the best town is to base ourselves in Cinque Terre if we want a relaxed honeymoon vibe? I’ve had friends suggest staying in Portovenere instead – they did a day trip there from the Cinque Terre and wished they’d stayed there instead – but would we regret not doing the Cinque Terre hikes? Cramming too much in to vacations abroad is a far too common problem, but we think that your itinerary isn’t bad at all! Before you got to Cinque Terre, be sure to keep an eye on this new law to limit visitors to the area. You might have to get tickets in advance! Hi there, my fiance and I are looking to travel to Italy for our honeymoon in the first week of september. We are looking for a somewhat relaxing vacation but would also like to tour around. We have about 7-8 days in italy. Wondering what you would suggest. I would like to either do the almafi coast or cinque terre depending on what you would advise for September, and maybe one other city. September is a great time to visit Italy. We suggest you surf through our blog for locations, day trips and adventures that interest you, but these popular places to get married in Italy also make for very romantic honeymoon locations. Hoping to travel to Cinque Terre in May for a few days. Can you suggest quaint places to stay but not hotels. We like to stay within the community and enjoy the surroundings. Unfortunately, we can’t help you choose your accommodations, but we usually use sites like booking.com. Also, before you got to Cinque Terre, be sure to keep an eye on this new law to limit visitors to the area. You might have to get tickets in advance. Thanks for a great site. We will be visiting Rome for 4 days and then heading to Cortona for a week in a villa, where we will take some day trips and cooking lessons. We have 2 nights, maybe 3 at the end of the trip. Since it will be mid Oct. I was thinking Amalfi and flying out of Naples. We will have a car in Tuscany. How long will it take to drive there? And would it make better sense to go to CT and fly out of Genoa. That sounds like a great trip! We suggest you play around with Rome2Rio.com, a website that helps you judge price and distances by any means of transport. As for where you fly out from, that probably depends on price also. Usually, the bigger hubs like Milan or Rome offer better prices. Your website is extremely informative and helpful. My husband, 14 year old son and I are going to Cinque Terre at the end of June (I know, it will be crowded). We’re backpackers and hikers so want to hike the whole length. I’ve heard you can do that and then take a train back. Is that true and where does that particular train leave from and where does it go to? Also, we have 2-3 days in CT. What is the mileage of the entire trail in one direction? We’re trying to figure out where to start and which town to stay in. There is a train that connects all five of the villages together and even continues on to La Spezia and beyond. We suggest having a look on the Cinque Terre National Park website (link here) to see which trails will be open while you’re there. You can also find distances and possible routes and town information there as well. Have a great trip! Very informative blog. Thank you for the information. My wife, daughter and I will be driving from Lake Como on April 6. We will be staying in Santa Margherita. April 6 and 7. Any advise on what to do in a day and a half or two days. Is it worth driving to Portofino? When we check out on the eighth we are driving to Rome. Should I bring back the car when I get to CT area and take the train to Rome? Sounds like a car in the CT area might not be too useful. Hi Jack, yes it is worth it to visit Portofino, but the town itself is closed off to cars. We suggest leaving the car in Santa Margherita and taking the ferry into Portofino. The same goes for Cinque Terre – all five towns are closed to cars, so it’s better, and less expensive, to travel by train from that point on. Have a great trip! Thank you for so much useful information. Fast trains run from La Spezia (the closest major train hub to Cinque Terre) to Naples. From Naples you can take a regional train to Sorrento or Positano. That said, the journey will still likely take you nearly 7 hours. Another option could be to fly from Milan down to Rome or Naples, though with security and whatnot, it might not be much faster. Check out http://www.rome2rio.com to see a brief of the journey or go directly to the TrenItalia website (www.trenitalia.com) to see your various options with stops and price included. Have a great trip! Well we are planing to go to italy in August and to be honest we want to see as much as possible yet the best. our main plan was to fly to Rome spend there 3 days go down to Amalfi cost for 2 days, go up to Florence for 2 days, spend an afternoon/night in Chianti, then take a train to Cinque terre spend like 2 days there, go up to Milan to only see the dome, and then rent a car and go to Lake como, Verona, then Venice. After reading your article i was thinking about skipping Amalfi and doing CT only since its on our way. what do you think? I know my plan sounds crazy but is it doable? and what about the transportation? What a great family trip! This website will show you all your transportation options with cost and time and can help you compare to choose the best option for you. Our tours can help you get the most out of your time in the area. For example, you can drive or take the bus or ferry up and down the coastline (you can even take the ferry one day, and the bus the next!) then head to Capri from Sorrento for a private day trip with our local expert guides on our Capri Day Trip. Cruise the coast of Sorrento & Capri aboard a luxury gozzo boat, stopping at the most picturesque stops along the way then tour Capri at your own leisure! Hi love your website! My girlfriend and I are planning on going from Milan to Cinque Terre, staying a night (2 full days), then heading to Rome for a few nights, then back to Milan. Given our small amount of time, what are your tips on where to stay in Cinque Terre to experience the best of, and most importantly how to travel (Milan – Cinque Terre – Rome – Milan). I’m a confident driver and would love the freedom to stop wherever catches our eye on the way but also thinking going by train might give us more time to spend in Cinque Terre and Rome. We’re not sure what your time limits are, but we think Milan – Cinque Terre – Rome is the right route to take. While we love the flexibility of driving, if you don’t have a lot of time (either to stop around or even just to get to your destination) high speed train is your best option. Plus, Cinque Terre is a car-free zone so a train will save you the stress of having to find parking outside of the area that’s safe and inexpensive. You can stay in any Cinque Terre city you like – the train connects all five towns, runs frequently and takes just 12 minutes to get from the first to the last town. Hello, my husband and I will be visiting Italy in September. I will be staying in Milan and want to do a day trip to either Cinque Terre or Camogli. I’ve never heard of Camogli but after reading a few of these blogs, I looked into it more. Seems lovely. We have never been to either and wondering which would be the best to visit. Or if you have any other suggestions of an Italian Riviera destination for a day trip from Milan. Thank you! This article about alternative options to Cinque Terre (including Camogli) might help you decide. All the towns along the Ligure coast have their own unique atmosphere and beauty, we’re sure you won’t be disappointed no matter what you choose! My fiance and I will be travelling to the Amalfi coast on August 29th from Rome. What is the easiest and most cost effective way to get from Rome to Positano. We will spend 4 days in Positano. From Positano we will be travelling to Greece. Any idea of the best way to get to Greece from there? I am flying into Rome on Sept 15th and flying out of Venice on the 25th, and am conflicted about my itinerary. I don’t have enough time to see both CT and the amalfi coast – but am wondering if Rome, CT, Florence, Venice makes sense? or if there is a different itinerary I should look at going south to the Amalfi coast and then looping back up to Venice. There doesn’t seem to be a good way to either without backtracking….I plan on doing it all by train whichever itinerary I decide on….Any suggestions you can provide would be much appreciated! Thank you! Based on time allotted, we think it makes more sense to focus on Cinque Terre rather than the Amalfi Coast. Like you said, it’s a more streamlined route and easier transportation-wise. Luckily for you, however, we have a great day trip from Rome: a private drive tour along the Amalfi Coast with a stop in Pompeii that could be the perfect option to see the Amalfi Coast during your time in Rome. Have a great trip! Of the two, which would be easier to travel with a 5-6 month old baby? We would definitely have a carrier, and possibly a stroller. Are any stroller rentals available from these 2 areas? Our pace will be slow and we would stay for at least 5 nights. Probably Cinque Terre would be easier with a small baby and a stroller. There are more paved paths and the trains are super convenient way to hop among the towns, whereas Amalfi has many many hills and even more steps! I’m traveling on myfirst trip to Italy, so the decision was quite difficult. I’m traveling with my boyfriend on middle October. Do you know how is the weather on that period? Already know that its autumn time. Is there going to be anything closed? We have searched that the capri day trip is on. We are arriving from France and are willing to visit Capri, Amalfi coast, Rome, Florence and Venece, so that we can then head to Berlin. Do you have any suggestion for our itinerary?We don’t have such an extended budget, that why we thought about Cinqueterre. Any other comment would be excellent for us! The weather in October depends on where in Italy you are. In northern Italy the weather has already turned and will be quite chilly, maybe with a bit of rain. In the central and south, however, it can still be warm enough for short sleeves or even a dip in the sea! Your itinerary depends on how much time you have in Italy. This article on managing your travel time in Italy might help you to decide. Have a great trip! Thanks so much for all this helpful info. My husband and I are planning a trip to Italy July 2017. We have around 10 days to spend and would like to mostly explore the coastal areas. Im very keen to spend sometime in Puglia and then am torn between cinque terra/Santa Margherita/Portofino etc. OR Almalfi coast/Positano etc..
We don’t want to jam pack the trip but are happy to hire a car and explore. How do you recommend we divide our time? And any itinerary suggestions would be SO appreciated as I’m very overwhelmed and confused! If you do decide to visit Puglia, we suggest staying south and visiting the Amalfi Coast. Cinque Terre is quite a hike from Puglia and will eat into your ten days. After all, jamming too much into your itinerary is a surefire way to overwhelm your vacation and one of the biggest mistakes travelers to Italy make. Whatever you decide though, you’re sure to see some beautiful sights! Hi, just discovered your site and it is great! I am thinking about visiting Pompeii and the Amalfi Coast. I thought about doing this on a cruise ship but it would be too rushed so I would prefer to do it by myself. These are my questions: I only have about five days. Could I reasonably see the Amalfi Coast and all there is to offer (within reason) and also get to Pompeii? You mentioned that October is still considered high season. So if I went about October 15-20 or 20-25 the prices would still be high? What about the weather? I know you cannot forecast what the weather will be but will I stand a reasonable change of mild weather mid or late October? Thanks! We think that visiting the area on your own is a great idea! You’ll have a chance to see the towns even after dark, which the cruise ship visitors aren’t able to do. You should be able to see most of the Amalfi Coast in five days, and even Pompeii. Amalfi has very little “down season” and the prices are usually quite stable because of that, but mid to late October is a much better time to go to avoid the crowds and hope to get a slightly lower price. The weather is just like that in a temperate location (i.e. getting chilly) but should still be quite mild overall. Cold in the mornings and night and warm during the day. 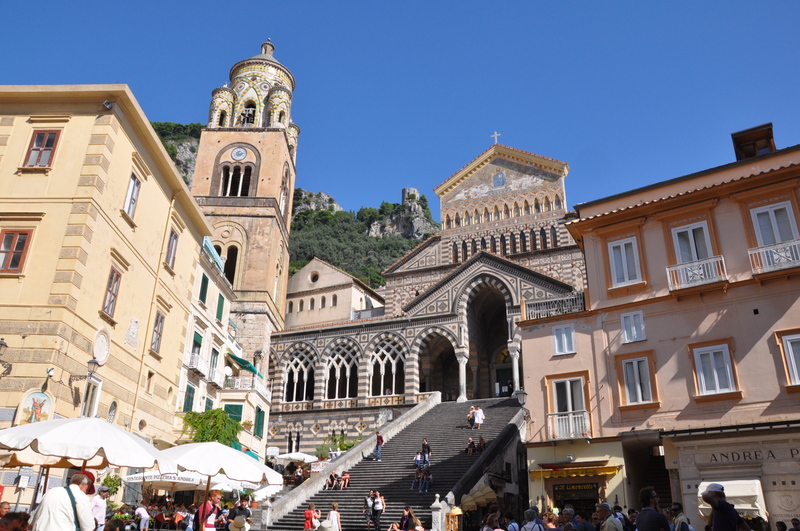 Check out our post on the Amalfi Coast towns and their different atmospheres to plan your trip! My husband and I are planning a trip at the end of May 2017. We will be visiting Florence for 3 nights and then Rome for 3 nights. We were hoping to find a train ride from Florence to Venice one of the days and then possibly a train ride from Rome to the Almafi coast one of the days. Does this sound like too much? The beginning of our trip we are Stopping in London for 4 nights with a train ride to Paris one of the days so total trip is 10 nights and we are really trying to see all we can while celebrating our 10 year anniversary. This will be our first trip to Europe! Any tips or advice is greatly appreciated! With this website you can see that a fast train from Florence to Venice takes about 2 hours and one from Rome to Sorrento on the Amalfi Coast takes about 2.5 hours. Meaning that you can feasibly do both in a day, but you’re looking at expensive train tickets and long days. With just 3 nights in Florence and 3 in Rome, we suggest staying in each city to see it better, possibly taking a day trip into Tuscany, like our Chianti, Siena and San Gimignano day trip with lunch in a vineyard. If you’re simply dying to go to the Amalfi Coast, consider letting someone else guide you to ease stress and waste less time. Here we have a Pompeii tour from Rome with a personal Amalfi Coast drive. Remember that there is a lot to see and do in both Florence and Rome, and each city merits the time, not to mention that constant traveling means “wasted” travel time and much more stress. We are travelling to Italy in late April 2017. We will be flying from France so undecided whether to fly to Genoa to visit CT or Naples to visit the Amalfi Coast. We have a week but plan to spend 3 nights in Rome before flying home. We are also travelling with an 11 and 9 year old. Want to see both but realise we don’t have enough time. What are your thought on that time of the year with 2 children? Both areas are fun for children, accessible and worth a visit. Perhaps the Amalfi Coast is a safer bet for less rain and warmer weather. Have a great trip! My husband and I will be in Sicily to visit relatives in June/July for 5 weeks. We have previously been to Italy and seen all the main tourist places (Milan/Rome/Florence/Venice/Pisa/Amalfi Coast). This time we thought we would like to see as much as possible of the Cinque Terre and Italian Riviera. Where should we base ourselves and what are some must-see places? We will be flying from and back to Catania. That’s a great idea! This article on the Best Italian Riviera Towns can help you decide where to stay and what to see. Have a great trip! So we are planning a first trip to Italy late May 2018 for a wedding in Tuscany. We fly in and out of Rome. We arrive on a Thursday and are scheduled to spend 4 nights in Tuscany,Pescaia where the wedding is. We could alter that to 3 nights giving us a Sunday to Sunday to explore and return to Rome to get our flight home. Can you help build an itinerary that will not be too complicated. Would like to combine and balance, sights, shopping, beauty, hiking and culture without to much stress of travel. Prefer not to drive. Sorry, but we aren’t travel agents, but we can suggest some great walking tours to try during your time in Tuscany! Hope to see you there! My husband, 8 year old son, my parents and mother in law, and I are planning a trip to Italy. We get into Venice on Mar 8th and we fly out of Rome on Mar 15th. We are really trying to make the most of our time but also want a variety while we’re there. We know we want to spend a couple of days in Venice and a couple of days in Rome. What we are struggling with is whether we should go to Florence and maybe do a day trip to Cinque Terre in the middle of our trip or go to Praiano and explore the Amalfi Coast instead. What would you recommend? How long is the train ride from Venice to Praiano and is it an easy train ride or lots of train switching? Thank you!! You can explore all your different transportation options with a fun website called http://www.Rome2Rio.com. (Though we suggest actually booking your high speed trains from an Italy-regulated operator like TrenItalia). The trip from Venice to Praiano is about 7 hours long and would require at least three train changes. To save on transit time, we’d suggest basing yourself more in the north and leaving the Amalfi Coast out for this trip, or else basing yourself in the south and focusing just on Rome and the Amalfi Coast. You don’t want to try to see too many things in too short a time! We’re planning a babymoon the first of May and will be in Italy for 10 days, most likely fly in and out of Rome, or fly out of Florence if we go there. We want a relaxing trip and want to go to Amalfi coast (not sure where to stay), should we stay in two spots in AC? Which towns? day or overnight trip to Capri? Do you think its a good or bad idea to add on Florence/tuscany for 3 days too? Its our first time to Italy so of course we want to see as much as we can! Its hard to decide! If you want a relaxing trip, we suggest doing either Rome and Florence, or Rome and AC, not all three. This way you’ll really get to enjoy each location and won’t have to rush from one site to the next! (See: the biggest travel planning mistake that most people make in Italy) As for where to stay on the Amalfi Coast. Our article about the Amalfi Coast towns might help you decide! Have a great babymoon! Hi there, thank you for the great information. I have not read all the blogs as there seems to be a lot but I have a couple questions I was hoping you could answer for me. I am planning our honeymoon there and this is what I am planning. Fly into Venice for 3 nights, train to Florence, Tuscany for 4 nights then head to Postiano for 6 nights (we want to check out Capri, do some hiking, kayaking hopefully fishing and check out other towns), then head back to Rome the day before we fly out. Is this doable. Can we get from Florence to Postino easy and by train? Also, any recommendations on where to stay in Tuscany as I have read about so many little towns I can’t decide on where to stay. Sounds like a great trip! You can go from Florence down to Naples on high speed train, then you’ll change to a regional train and make it down to Positano. Book your trains at http://www.trenitalia.com. Sorry we’re not in the accommodation business, but this article of the Top Ten Tuscan Towns has some of our favorites! Have a good trip! We agree, 9 days is a bit stretched to do all that traveling. If Rome and Venice are sticking points, we’d say that the Amalfi Coast is a bit off the path for this trip. Why not take a train from Venice to Florence, then get a car out to your friend’s B&B? The main problem for anyone planning a trip to Italy is that it’s impossible to see everything you want in one trip! Maybe this article can help you. Thank you!! Their B&B is in Pontremoli, Tuscany….is that very far from the Cinque Terre? Wondering if either stop is possible or if we are better off just sticking to Venice and Rome. Would it be a crime to be there and not go to the coast somehow? You could always tour the Tuscan coast! Get a map and navigate your distances – we really like http://www.rome2rio.com to consider our different time/distances when deciding an itinerary! I just visited the cinque terre region and it is so full of tourists and the locals have become so greedy they just rip off the tourists and the overcrowded trains and boats are awful. I would find somewhere else to go, the beaches are terrible and the water which would have once been pristine and clean is not so anymore. We were told of these beautiful beaches only to get there an be disappointed, we were also advised of great restaurants to try which were well below average and when we finally found a restaurant that had quality food, the waiters were rude and arrogant and we even had to wait 30 minutes to get the bill to pay, we were so fed up waiting, we were not going to wait another 30mins just to pay by card or get change, so we searched our pockets to get the correct money and just left it on the table so we could get out of there. Totally disgusted with the place. I’m planning a trip to Italy at the last week of september! I love short day hikes but also great beaches. Which area would you recommend? I also dont drive stick shift and prefer places with decently good train system. I am currently considering florence, lake como, amalfi coast, cinque terra. but am open to hear any ideas! Based on your considerations, we’d suggest to cut the Amalfi Coast, since it’s a little off-track and will take away a lot of time if you only have a week, and stick with Florence, Cinque Terre and Lake Como (more or less in that order). Have a great trip! My husband and I are planning a trip for our 20th anniversary and hope to cover Rome, Tuscan region, Venice and possibly Florence in 14 days. I’d like to include Almafi or Cinque Terre as well and wondered if we should do a day trip from Rome to Almafi or try and stay in Cinque Terre and do the day trips to Tuscany (wanting to visit wineries and possibly a bike tour). We will go in either April or September, we haven’t really decided yet. We are just in the early planning stages so any advice on which route to go would be greatly appreciated! Thank you! Besides the tips that you’ll find in this blog post, we’d suggest choosing based on ease of transport and how long you’ll want to stay in the other destinations. We do have an excellent boat tour along the Amalfi Coast where you can boat-hop your way from Positano to Amalfi Town and Salerno or a private drive along the coast with a expert-led tour in Pompeii, also from Rome. If you do that, you can dedicate more time to Rome and maybe even add in an overnight to Cinque Terre! This is a really helpful page! My wife and I will be travelling from Nice to Florence and then Rome. We both love swimming in the sea so were wondering if you would be so kind as to recommend good beach places to go to in Italy? Does Elba make sense? I understand Amalfi and CT dont boast great beaches so was wondering what else is easily accessible but a good beach place. Thank you so much in advance! Elba has lovely beaches, but it’s an island off the coast and not an easy place to stop for a day trip. Go only if you’re able to dedicate a few days to the island! Cinque Terre is beautiful, but most of the beaches in Liguria (including those in CT) are pebble beaches and not sand. You’ll find more sand beaches along the Tuscan coastline. Have a great trip! Hi. Great blog! We are planning an anniversary trip of 3 weeks to Tuscany (driving, wine, small towns, b&bs). We also would like to spend some 4 days in CT or Amalfi, and she wants to visit Venice and Rome. Yes, far from each… any recommendations on planning? Regards!!! We recommend the other pages on this blog for inspiration (like this Top Towns of Tuscany post) and Rome2Rio to understand better distances and transportation. Happy Anniversary! Hello – we are planning our first trip to Italy. there for 10 days. Arriving in Venice (2 days) then to Florence (2 days) then on our own staying in a farmhouse in san gimignano. Trying to decide whether we should spend a day traveling to Pisa? or use the day to explore the countryside and little towns of Volterra, Siena, etc. Not rushed — stopping wherever / whenever. Any suggestions? I am also a bit overwhelmed about the tours in Florence. I want to see so much but only have one full day there since we arrive in the afternoon and depart the morning of the 3rd day. Is the Pisa trip a must? San Gimignano is a small town and not connected by train. We’d suggest exploring the towns nearby by either bus or car. If you had more time in Florence you could consider taking the train from Florence to Pisa for a half-day trip, but with just one full day we’d suggest focusing on Florence, it’s a beautiful city with so much to see! Day tours can really help you maximize your time there. Flying into Milan early on Friday Sept 14th and staying down in Tuscany/Montecatini. I’d like to get down to Rome as well as up to Venice. The following Wednesday I need to be back in Milan (where I’m staying that night) to fly out the next afternoon. I figured I could drive down through Genoa from Milan and see Cinque Terre on the way as well as stop at the Pisa before getting to my hotel Friday afternoon. Take the high speed train down to Rome on Sunday and spend the night there so I can explore both Sun and Monday. This leave only Tuesday to take the Express up to Venice and get back the same day. Any suggestions? We don’t think that’s possible. You’ll surely be tired after your flight, but also the time it takes to drive to all those destinations means you’d get to Tuscany much later than the afternoon, even if you didn’t stop to see anything! In 6 days, we’d suggest choosing just two destinations (this article might help you) but if you must, try taking the high-speed train from Milan to Florence, then Rome, up to Venice and back to Milan for your flight. If you only have little more than one day in each destination, we’d suggest looking into some guided tours, to see then most in the time you have! Hope this helps. We are spending a month in Rome next May. This is our fourth trip to Italy and I have not yet been to the Cinque Terre. Am hoping to fly into FCO five days early and take the train to the CT right from the airport. We have no experience with trains in Italy since in the past we rented a car. I am fearful this will be grueling after a trans-Atlantic flight. I looked into flying into other airports like Pisa and Genoa but my “points” airline does not offer non-stop to these cities and the lay-overs defeat the purpose. My apartment in Rome is rented and I have my return flight booked. I actually considered staying in a hotel near Termini on arrival day and setting out the next morning. Am stressing over this. What do you recommend? Thanks for your help. We think you’re right, after a transatlantic flight a trip to Cinque Terre right away would be pretty rough. Consider that you’ll probably take a high speed train into Florence then make a change onto a regional train to La Spezia, with another change in La Spezia into Cinque Terre. It will be 4-5 hours of train travel. We’d suggest resting that first day and setting out the following to truly enjoy your time in Cinque Terre! Hello, three friends and myself are planning to go to Italy in September 2019. This is my itinerary thought and wonder if you could give me any feedback. Fly into Venice and then spend the following two days in Venice/Burano. On the third day take a train to Milan. Spend three days in Milan exploring the area (Lake Como, Bellagio, Lugano in Switzerland, etc.). 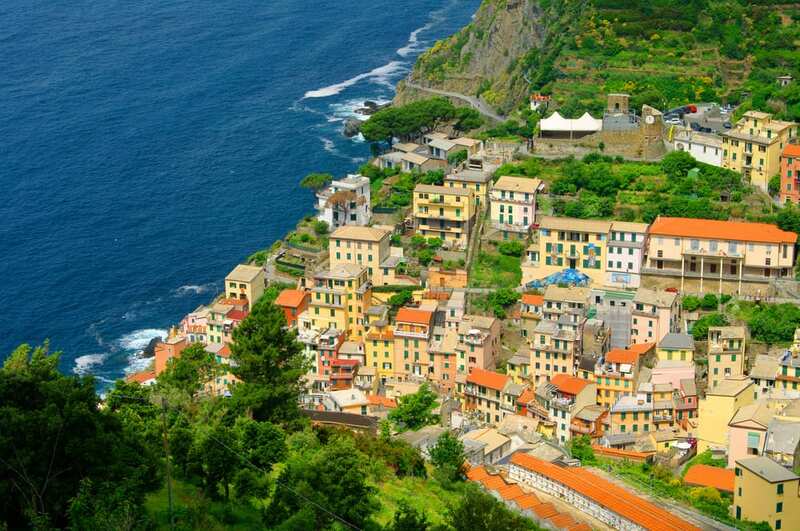 Then take the train to Cinque Terre and spend two days there. Then back to Milan and fly out the next day. BTW, your blog helped me tremendously to decide between the Amalfi Coast and Cinque Terre. I chose the AC and am glad I did. But now I want to include CT in a trip. Thank you! That’s so good to hear! Your itinerary for the north this time actually sounds perfect, I wouldn’t change it. Como region is gorgeous that time of year too. Hey, me and my husband are planning to go italy for 2 weeks. 3 days in Rome, 2 days in venice, 2 days in tuscany and then take the train to naples for amalfi coast. ( can’t decide whether to go positano or amalfi) . So we have 5 days all together in which I want to do day trip to capri blue grotto and 3 days in sicily.. Please tell me how do I plan these 5 days including amalfi and sicily.. Is it possible?? The ferry/train time is stressing me out..
Actually, we think that sounds like a really rushed itinerary (see: the biggest mistake visitors to Italy make). That said, you could boat-hop your way from Positano to Amalfi Town and Salerno on our day trip from Rome. So that in one day you can see three towns. Then, from Rome you can take a ferry to Sicily.